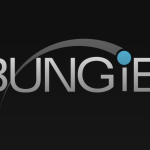 In September 2014 Bungie’s Destiny was released, and with its half ‘n’ half brand of MMO and FPS it captivated and aggravated players in equal measure. Many hated it, many loved it, some were apathetic and others just refused to buy into it at all. Vault of Glass was an excellent raid for Vanilla Destiny, but despite the hard work Crota’s End required in The Dark Below, it wasn’t enough to elevate the first expansion to anything other than a bog standard add-on, and it didn’t really add anything in terms of story. House of Wolves at least gave more to do in terms of post-campaign content with the Trials of Osiris and Prison of Elders, even though they were completed within mere days by dedicated players. Fast-Forward to September 2015 and what Bungie lovingly refers to as Destiny’s “Year Two”. 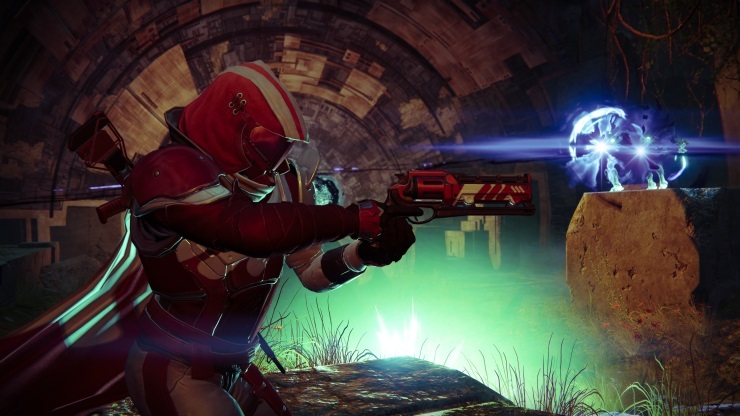 The developers have revamped the game’s loot and leveling systems and now furnished Destiny with its third and biggest expansion yet. Will it enough to entice back players who had grown weary of Destiny’s core loop of shooting and looting? And will it be enough to keep the loyalists loyal? Initial impressions are favourable: Bungie have finally given Destiny something resembling a story. Cayde-6, Commander Zavala and Eris Morn are granted personalities, with Nathan Fillion’s comedy turn as the (self-proclaimed) “roguish commander” standing alongside the po-faced Zavala and Eris’ “crazy cat-lady” routine. 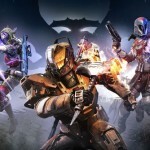 These three provide the bulk of story exposition as you progress through The Taken King’s new missions. It’s a shame that Ikora Rey isn’t granted the same treatment and – considering she wasn’t really featured in House of Wolves – Queen of the Awoken, Mara Sov could really have done with more love outside of her “blink and you’ll miss it” appearance. Throughout your adventure you’ll come across the Fallen, Vex, Hive and Cabal once again, but Bungie have taken their model recycling to the extreme with the new enemies. You see, Oryx has created an army by taking (see what they did there?) whoever he likes and making them serve him. As such the Taken are all the enemies you’ve seen before, just in a new smokey black hue with a nice glowing weak spot to shoot. Regardless of this they are a very good enemy to fight; they attack en-masse and divide in two if not taken down in a timely manner. It certainly makes things more interesting when you’re trying to divide your time adequately between killing Taken and attacking other enemies or bosses. Locations are recycled too, with many areas from the Moon and Earth re-used, as well as a similar trick to House of Wolves’ visit to the Vault of Glass that throws up an interesting surprise (which I won’t spoil here). It’s a shame that Phobos’ use in the game’s opening isn’t really expanded upon; it’s used once and then just discarded like a prophylactic. 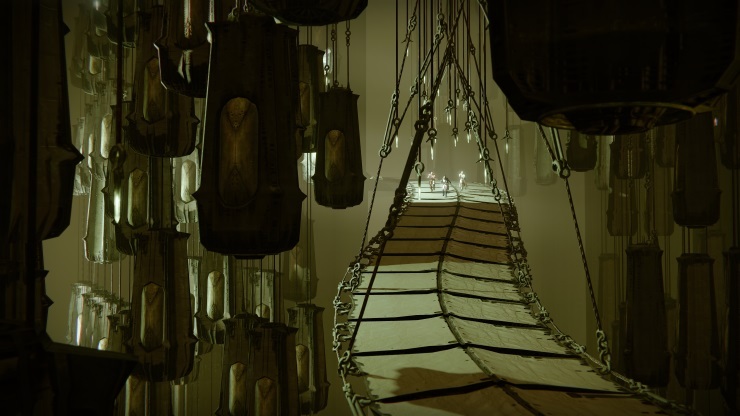 Yes, Bungie have given us the Dreadnaught to explore, but in terms of décor it’s very similar to the Hive areas of the Moon, and has an extremely boring grey and brown colour palette. I’m not saying that evil overlords should have better taste in interior design, but it wouldn’t have caused any harm to throw a little bit of colour in there. As well as the cutscenes and now near-constant radio chatter, a new feature is enabled into your Ghost (now voiced by the ever in work Nolan North). At times, as you wander through the locations you’ll see the Ghost symbol in the top right corner, this signifies that there is something ‘scannable’ in the nearby area. Opening your Ghost sends out a ping and anything you can scan is highlighted with a virtual mesh. Doing this gives you story snippets fleshing out the new narrative a little more – it’s not much, but it’s very Metroid Prime-esque and will have completionists twitching over every environmental detail. In a move that will relieve a lot of players, leveling up is now completely down to XP you have earned and no longer held behind the light levels of the gear you pick up. 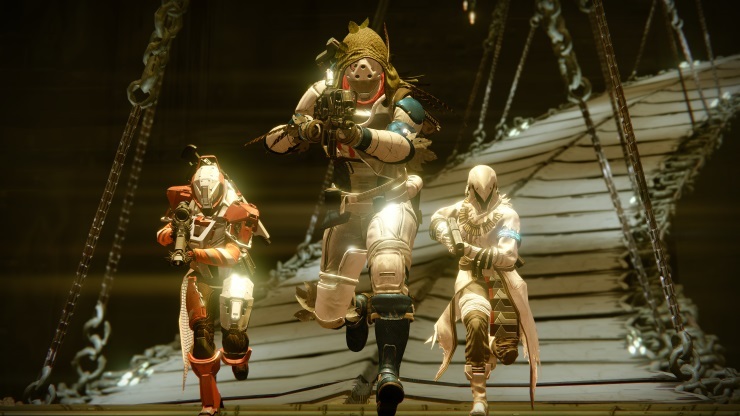 As such The Taken King doesn’t rely on players to devote hours of time to the multiplayer or require access to a circle of friends they can raid with just to hit the level cap. The loot system has been improved too. Granted, it isn’t at Diablo 3’s level yet, but you will find yourself inundated with more gear and engrams than before, meaning you’ll have to make more decisions as to whether you want to dismantle that item or not (for the most part, you will do). There are also more ways to get gear than before. The multiplayer factions no longer require you to actually play the MP to earn reputation, instead you can trade in easily farmable items for small rep boosts, or by wearing their “badge” any single player quests you do will grant you a little more reputation with them. It’s not much, but it does expand the possibilities for acquiring new items. You will need to take these new items into account even after level 40. The basic level number doesn’t mean anything apart from dictating what gear you can and cannot equip, after that it is back down to our old friend “Light level”. Unlike before though, your light level is calculated on your attack and defence power of your equipped items. There is stuff gated behind suggested Light levels, but overall the process of acquiring higher attack and defence values is much more simplified than it was before. 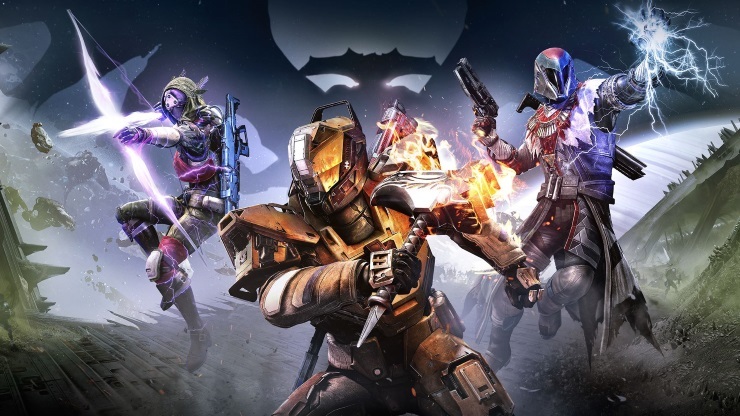 Heroic stories, Nightfalls, Heroic Strikes and the Raid are all restricted by different light level requirements; however, once you have dispersed with what appears to be the story content you will find more quests thrown your way. After playing through the original game and the prior two expansions this came as a bit of a shock, as I was expecting it to be another tiresome grind, but it does seem that Bungie have gone all-out to give players more to do once they’ve blasted through the narrative. What’s more, is that so far it’s still going. Handing in a quest is giving me another three or four to do, and so on; add bounties and multiplayer and you’re really looking at a silly amount of stuff going forward. The new gear is, quite frankly, lovely. New guns have nifty holographic sights, while upgrade paths are more simplified and require less materials than before. Brilliantly, swords are now a permanent feature. Finishing a quest line grants you your very own to use how you see fit. Unfortunately, it counts as a heavy weapon and consumes that ammunition when used, but its deadly blade dance it great to watch and slicing through enemies never gets old – just try not to forget yourself and use it on bosses. The new class powers are truly excellent; they’re unlocked via a quest that needs to be tackled solo, as if your Guardian is embarking on some spiritual journey. They’re really nicely done and have a great atmosphere to them. 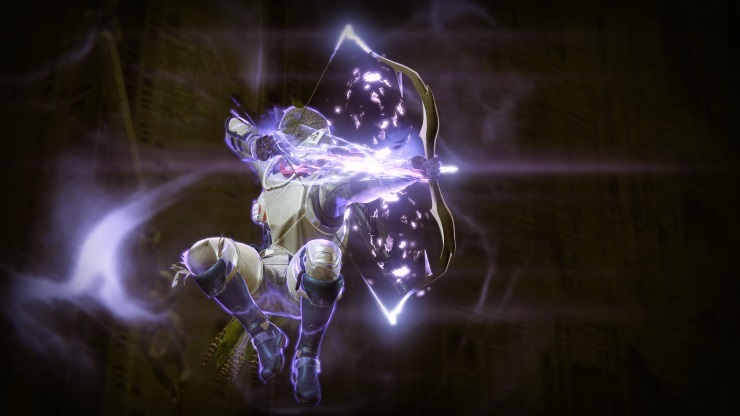 Once acquired, the Warlock’s Stormtrance, Hunter’s Shadowshot and Titan’s Hammer of Sol abilities all create fabulous lightshows and do ludicrous amounts of damage. They’re currently overpowered though, and I fully expect them to be nerfed at some point, so enjoy them while they’re hot. A lot of work has gone into making the new strikes interesting as well. They’re not too long, and now incorporate Raid style tactics into the boss fights, meaning you’ll need to pay attention and work together to stand a better chance of succeeding. Fighting in the dark, having to fulfil a requirement before attacking, prioritising a target while dodging the attacks of two bosses – Bungie have really changed things up a notch here. It’s a shame that the PvP (player versus player) element hasn’t received the same amount of love that the PvE (player versus enemy) portion of the game has benefitted from, with only two new modes added. Rift is a take on Spaltoon’s Rainmaker mode, tasking you with carrying a “spark” to your opponents’ base to slam it home into their Rift, which really isn’t as fun as it sounds. While Mayhem goes for all out carnage, it ramps up the recharge times of your abilities, which at very least makes for silly fun. The new maps aren’t great, though. They’ve got complicated layouts and lack the flow of the originals, which is such a shame as they’re just not fun to be on. Regardless of the MP, it’s not a stretch to say that this is how Destiny should have been from the start, and it’s unfortunate that while these changes have improved the base game immensely, there’s not going to be anything to convince those who grew tired of vanilla Destiny. 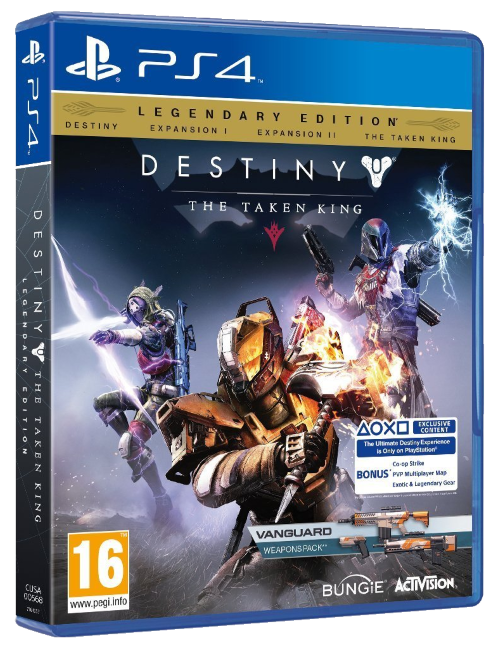 In fact, starting again from the beginning sees no change and the new additions don’t really take effect until you get to the The Taken King content. Realising this, Bungie have seen fit to grant players a boost from level 0 to level 25 (for one character only), immediately opening up passage to The Taken King missions, along with relevant-level blue gear. While this is a welcome addition, in typical Destiny style it is not without problem. Yeah, it’s great that you can leap straight into the story of the Guardians versus Oryx, but there is one fundamental flaw. You see, you’re given the levels, and you’re given the gear, what you don’t get however, is the relevant XP in your abilities. So, you’ll find yourself at level 25 with no powers, no double jump and a bog standard grenade – it’s a massive oversight, as the likelihood of survival without those abilities is pretty low, meaning that you’ll pretty much have to go back and do the old story content anyway, just to allow you to hold your own. And there’s the rub, you see: for all the improvements that have been made, the core loop of shooting and looting is more present than it’s ever been, you just have more options on how to go about it. For staunch fans like myself – who spent a ridiculous amount of time doing similar in games like World of Warcraft – it’s great, but for those who don’t like to farm to this sort of degree it’s going to remain a hard sell. What we have here, then, is Destiny 2.0. It’s more of the Destiny that the fans love, with enough tweaks to keep them grinding for hundreds more hours to come. 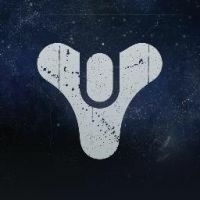 This is the game that Destiny should have released as, and there’s no doubt that people jumping into it for the first time are getting a great game, and a lot of it at that for a lovely low price, while dedicated players will enjoy themselves immensely while nursing their poor wallets back to health. For once, it’s nice to see some positivity directed at Bungie’s sci-fi shooter. Let’s see how long it lasts. The Taken are a great enemy. Gunplay is still so good. Still very much recycled content. Core loop of shoot and loot is unchanged. Fast tracking to level 25 is half-baked. It’s been a year, and the coming of The Taken King has finally made Destiny the game it always should have been.